Say "yes!" 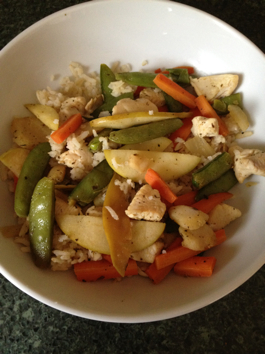 to apples in stir-fry! This recipe is adapted from a recipe that I saw on morefruitsandvegetables.org. I just added some tasty and super healthy additions. It's Tuesday and I've already made this salad three times since Saturday...it's so good! Packing less than 250 calories and loaded with heart healthy walnuts, flavorful cranberries and muscle building chicken, you can eat it with soup or on it's own. 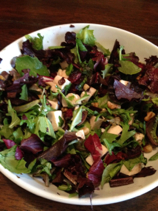 Time saving tip: next time you grill chicken, make extra for salads like this!